There was an elephant called Gajendra. He was the king of elephants and when he moved the earth trembled. Th shrubs were stamped and the smaller animals fled when they heard him walk. Such was his presence. One day Gajendra went to the Trikuta mountain with his entourage of wives and other elephants. Trikuta is a beautiful place with lots of rivers and lakes. In one of his valleys was a garden belonging to Varuna named Ritumat. This garden was full of flowers and fruit trees. In the midst of this garden was a beautiful lake with golden lotuses. To this lake, Gajendra came with his entourage to have his bath. All of them had good fun frolicking in the water. All but Gajendra left the lake. He kept on spraying water with his trunk. Suddenly a crocodile came up and caught one of his legs. In vain he tried to free himself up. But crocodile in water is mightier than an elephant. The friends and the wives looked on in horror but none could do anything. The fight between Gajendra and the crocodile lasted for a 1000 long years. The friends and the wives had all gone away. Gajendra was getting weaker and weaker when suddenly he remembered the prayers he used to say in his previous life. In his previous life Gajendra was a king named Indradyamuna. When he got old he took retirement and went to the forest for meditation. As a part of his austerity he took a vow of silence. There came one day a sage named Agastya. When Indradyamuna remained silent without greeting the rishi, he was angry and cursed him. The crocodile in his previous life had been a Gandharva called as Hutu. One day while in water, just for fun he had pulled a leg of a muni named Devala. Devala muni had cursed him to be a crocodile. 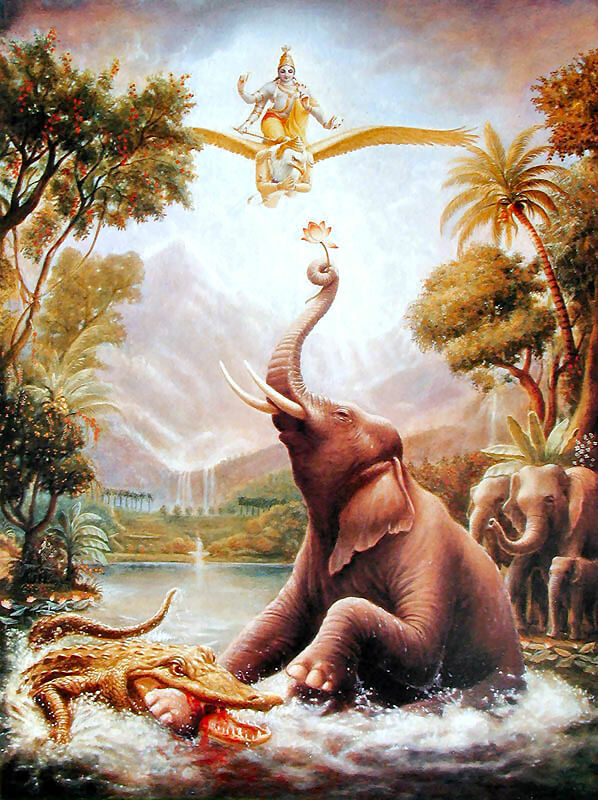 As soon as Shri Vishnu heard Gajendra’s prayers, he mounted his vehicle- Garuda and reached the lake. He took his chakra and chopped off the crocodiles neck thus awarding him salvation. And then he asked Gajendra, “why did you take such a long time to call out for me” and then he summoned a golden aeroplane and took Gajendra with Him to His abode. There lived a boy named Dhayiya in a village with his father and stepmother. Now this boy was a bit on the heavier side. He was called Dhayiya because every day he ate ro-tis made of 2 and a half kilo of wheat flour. ( in Hindi dhayi means two and a half). Then one day his father left this world. For some days his neighbours took care, then some relatives and then some villagers. But because of his appetite, none could feed him for long. Ultimately one day he was sent out of the village. The boy started walking. During meal time he felt hungry but there was nothing to eat. Finally it was pitch dark, he was in a jungle and he was very very hungry. So he started crying. After some time, he saw a tiny lamp burning somewhere. Hee just followed the light and reached a temple. The priest there was just about to lock up and leave, when he noticed Dhayiya crying. On understanding that Dhayiya was hungry, he gave him the food offered to Sri Ram and Sitaji, the presiding * of the temple. ‘I know nothing except eating, ‘Dhayiya said. ‘Hmm’, the priest said, ‘In that case, you can take the cows to graze in the morning and bring them back in the evening. And you will get your rotis of two and a half kilo wheat flour in the morning and evening. Dhayiiya was happy and life was fine till ekadashi——+. On ekadashi the priest told Dhayiya that he would have to fast. Dhayiya said he cannot fast. So he makes five rotis each of half a kilo each. And then he calls on the Lord, ‘Oh Ramji, come and have some food’ but no one comes, Again he calls out. And then again. Third time he notices a man with a bow and arrow. Dhayiya keeps a plate ready. But then he notices Sita. He prepares a plate for her too. Both eat one one and then ask for more, So he gives them one more each and thinks that alright he will manage with one today. But then Sita mata and Ramji ask for some more and divide the one left amongst themselves. So Dhayiya has to fast that day. 15 days pass. Its ekadashi again. This time Dhayiya asks for 5 kg of wheat flour. The priest is puzzled but doesn’t say anything. But this time Ramji, Sita mata come along with Lakshmana. And they polish off all the five chappatis. So Again, Dhayiya observes Ekadashi that day too. The next Ekadashi, he asks for seven and a half kilo of flour. Now the priest is really curious, He pretends to go our but instead he hides behind the bushes. In no time Dhayiya calls out, “O Sita Mata, O Ramji”. In some time Ramji comes, Sita Mata comes, Lakshmana comes, followed by Hanuman. Dhayiya says, ‘If you want to eat, cook yourself’. Ari Ram sits in a corner, Hanuman goes to fetch firewood. Lakshman goes to draw water from the well and Sita mata sits to knead the dough. Dhayiya begins to massage the Lord’s feet. Dhayiya understands that he can’ see anyone and requests the Lord to show Himself to the priest too. Everyone appears, the priest is astounded. Moral : Faith matters, Only love and devotion can bring you near to the Lord. Suniti had a son named Dhruva. Dhruva one day went and sat on his father’s lap. Suruchu got angry and asked him to get down. Dhruva was very angry and asked his motherSuniti why he could not sit on his father’s lap. His mother sadly replied that only God can answer that question. Then Dhruv asked, ‘Where can I find God?’ Suniti replied, ‘in the forest’. So Dhruva started his tapasya along with reciting the mantra. Dhruva was so happy to see the glorious form of the lord that he said he was happy to see Him and he did not want anything else. Then the Lord said when your father becomes old and goes to the forest, you will rule the kingdom for 36000 years. After that I will send you a golden aeroplane and then you will live in a star of your own. The bright twinkling star near the North Pole, is Dhruva’s home and is known as Dhruva star.